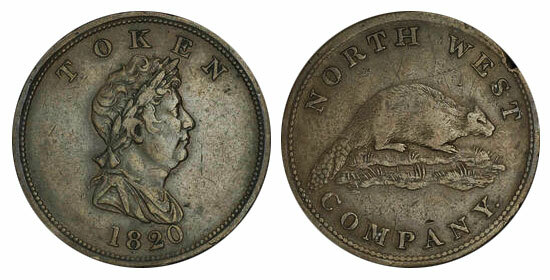 These tokens were probably struck in 1820 in Birmingham, England, by John Walker & Co. for canadian et american markets. Their value is "One Made Beaver." All but one known specimen are holed, and all have been found in the region of the Lower Columbia River and Umpqua River valleys in Oregon. Less than 10 copper variety are known. It exists several modern reproductions of this rare token. Text : Token 1820. North West Company.